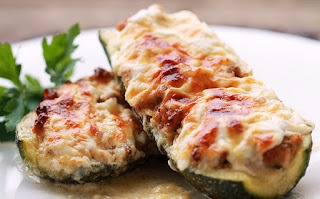 These vegetarian stuffed zucchini are a delicious and hearty meatless meal option, or the perfect side dish to just about any kind of grilled or roasted meat. It’s a delicious way to get even the pickiest eater to eat their vegetables and this is definitely a recipe you’ll want to make again and again! Trim stem ends from squash. Cut about ⅓ off the top of each squash horizontally. Dice the tops to small dice and set aside. Cut around inside of squash then scoop out inside until the squash resembles a canoe. Try not to cut through to the bottom. In a large frying pan heat the oil over medium heat. Add onion and cook for about two minutes, until soft. Add garlic, red pepper, mushrooms and cut up zucchini tops. Mix to combine and sauté for about one minute. Remove from heat and mix in oregano, basil, parsley, salt, pepper, bread crumbs and both kinds of cheese. Mix to combine. Divide the filling between each zucchini boat. Press into squash filling and pressing as you fill to hold shape. Bake uncovered for 35 - 40 minutes. Try not to overcook, otherwise, the zucchini will start to sag and the filling will not stay in. As soon as they come out of the oven, sprinkle the tops with additional parmesan cheese and serve. Do not miss the recipe, follow us on Facebook, click here !